The 1950s were the era of the streamlined diesel, with the Electro-Motive Division of General Motors producing perhaps the most famous face of the era -- the bulldog nose found on its E and F series units. In the 21st century there are many survivors from that era, and most of those have found their way into museums or in service on tourist railroads. Thus, it's a bit noteworthy when one of these survivors succumbs to the scrapper's torch. Such was the case on April 10, 2014, when FL9 No. 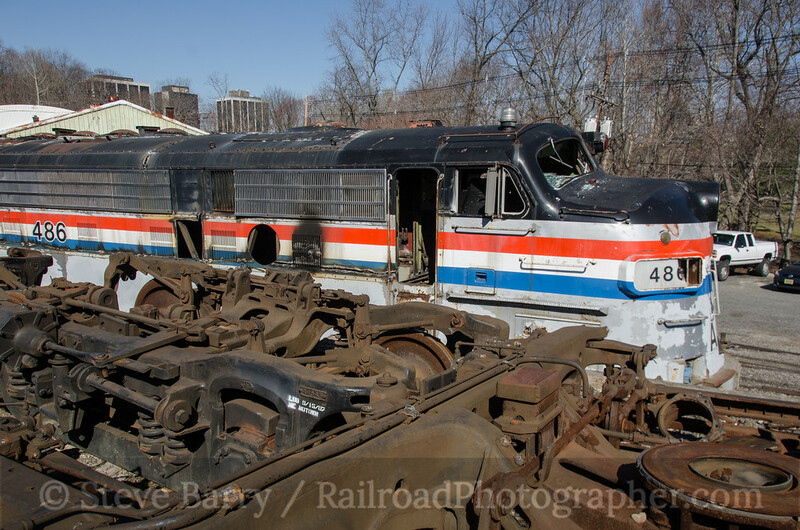 486 met its demise in Morristown, N.J., just days after sister No. 487 met a similar fate. First, a little background. No. 486 emerged from EMD in September 1957 as No. 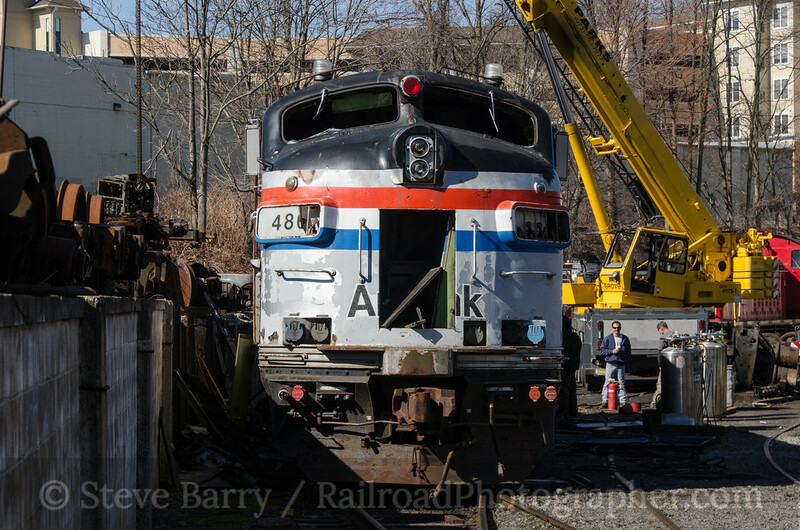 2013 for the New York, New Haven & Hartford Railroad. The FL9 model was unique in that it had five axles -- EMD's F-unit series (primarily for freight) rode on two two-axle wheel sets, while the E-series rode on two three-axle wheelsets. The FL9 had two axles on the front truck and three on the rear. They were originally designed to haul long-distance passenger trains across the west and needed a large water tank to produce steam heat for the coaches; the three rear axles were intended to support the weight of all that water. A western buyer was never found, but the New Haven needed a dual-mode locomotive that could run as a straight diesel-electric locomotive in open air, but could also function as strictly an electric to avoid fumes in the tunnels into Grand Central Terminal. The extended body and three axles of the FL9 allowed the unit to carry additional equipment to function as an electric. The New Haven was absorbed by Penn Central in 1968, and the PC was folded into Conrail in 1976. Conrail divested itself of passenger operations in 1981 and No. 2013 (now numbered 5013) went to Amtrak as No. 237 for service between Albany/Rensselaer and New York. 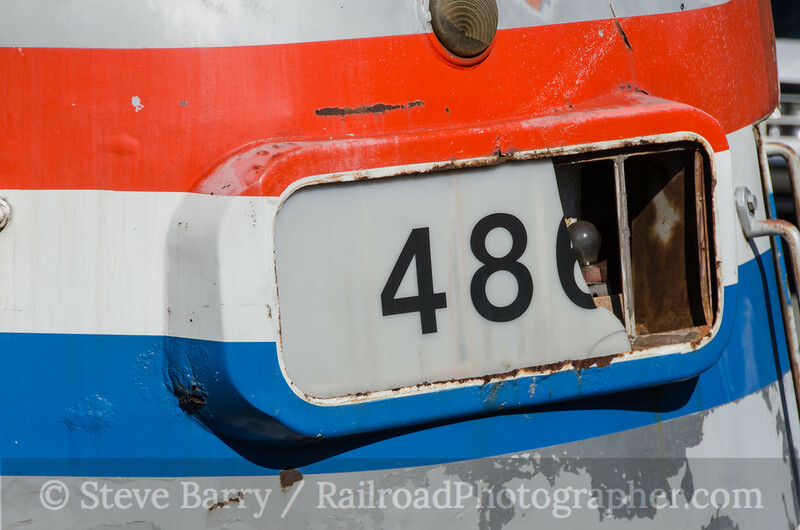 Amtrak would later renumber it 486. When Amtrak retired its modest fleet of FL9s, five were picked up by the Morristown & Erie for service on its subsidiary Maine Eastern. That brings us to the present. 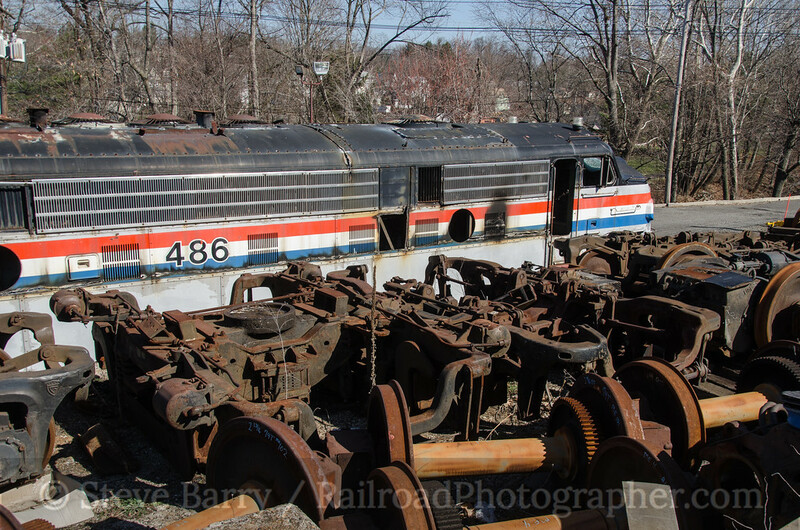 The Morristown & Erie had accumulated a number of locomotives for parts to keep other locomotives running. FL9s Nos. 488 and 489 were happily running on the Maine Eastern, while Nos. 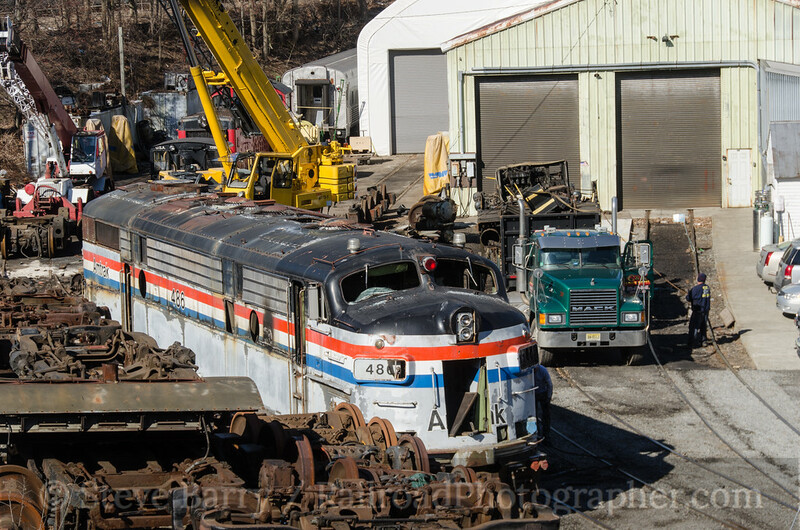 485, 486 and 487 languished in New Jersey, stripped of useable parts and for sale. After a decade with no buyer coming forward, they became part of a house cleaning on the M&E. Canadian National M420W No. 3562, Canadian Pacific C424 No. 4231 and Erie Mining RS11 No. 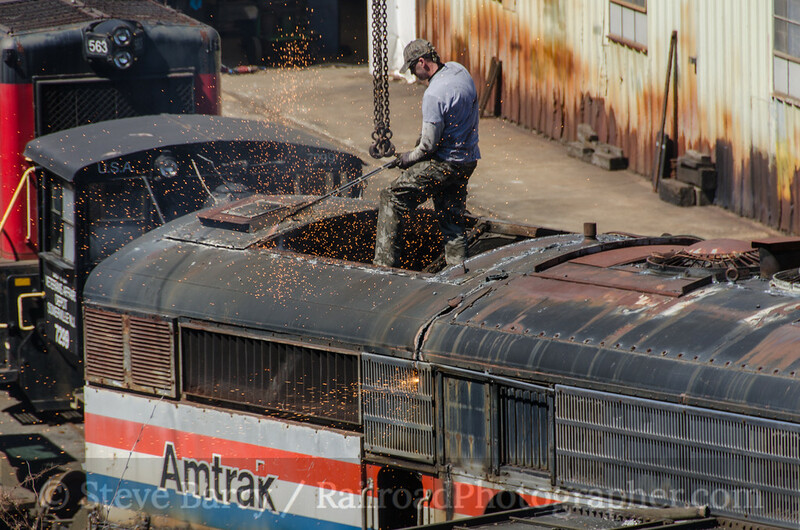 7205 were all cut up; all three of these were built to the designs of the American Locomotive Company (the two Canadian engines were actually built by Montreal Locomotive Works) and had donated their useable parts to keep Morristown & Erie's Alco fleet running. FL9s 486 and 487 were also scrapped, while No. 485 received a reprieve (for now). On the day of the scrapping, No. 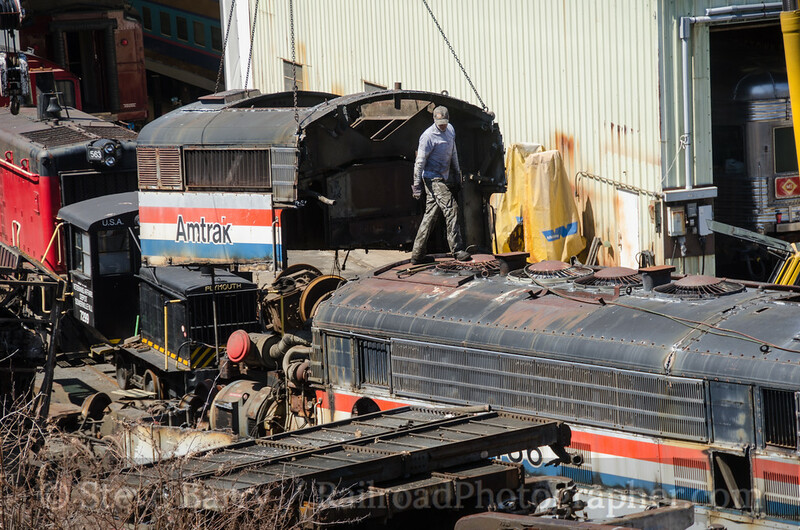 486 was cut lengthwise below the blue Amtrak stripe to facilitate the removal of the long hood, allowing access to the engine compartment for the removal of the prime mover. A few vertical cuts were made to allow the hood to come off in sections. Soon the dismantling started as a crane began lifting pieces of the carbody away. While it hadn't run in years, No. 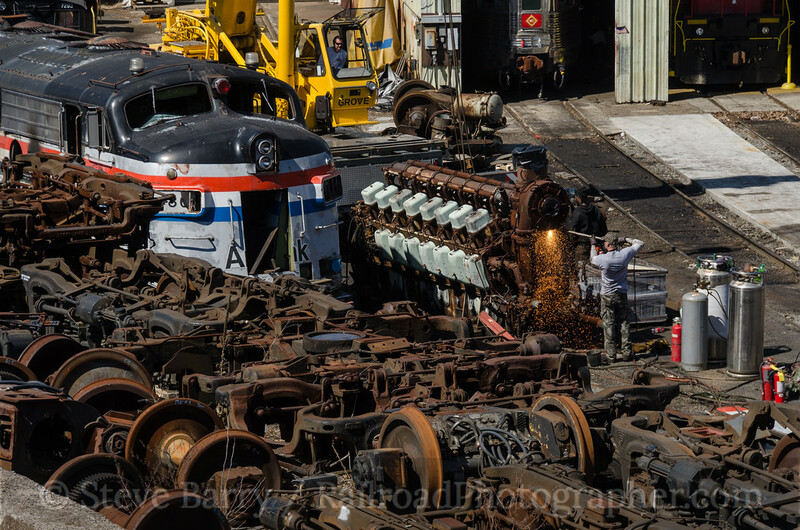 486's final act was as a parts source to keep two sisters running. The loss of an FL9, while sad, is not tragic -- as a model, the FL9 is very well preserved. Of the 60 units built, over a third of the fleet still survives, with many in active service. Nonetheless, in this century it is still difficult to see a survivor of the 1950s streamlined era meeting its end.